"We'll be calling President Moon very soon" when he gets on Air Force One, as well Japanese Prime Minister Abe, says @POTUS. During the flight from Vietnam, @POTUS spoke for ~10-15 minutes separately to @moonriver365 and @AbeShinzo to brief them on the TrumpKimSummit, according to @PressSec. 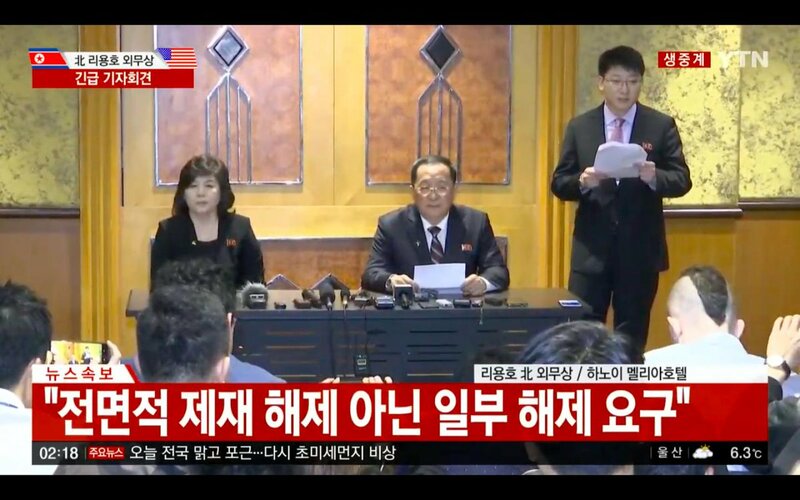 Choe Son Hui, North Korea's vice minister of Foreign Affairs and one of Pyongyang's most prominent interlocutors with the U.S., adds: "I cannot guarantee that this opportunity will be offered to the U.S. once more." Extraordinary midnight press conference from North Korean Foreign Minister Ri Yong Ho in Hanoi directly contradicts Trump's version. 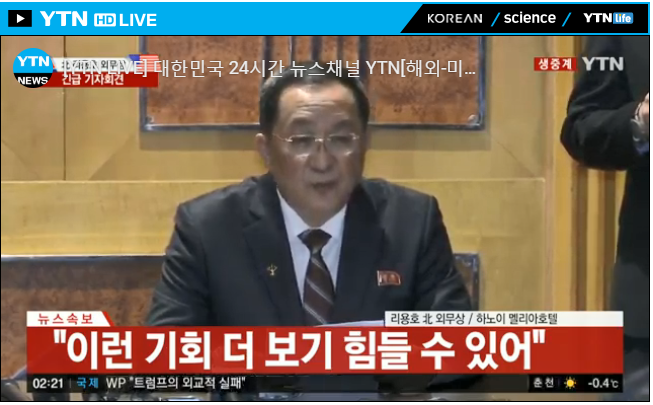 When the U.S. demanded a further step beyond Yongbyon, Mr. Ri said, "it became crystal clear that the U.S. was not ready to accept our proposal." North Korean official says "Chairman Kim got the feeling that he didn't understand the way Americans calculate" says Kim may have "lost the will" for further negotiations. North Korean official said they asked for 5 of 11 sanctions to be lifted in exchange for partial denuclearization. 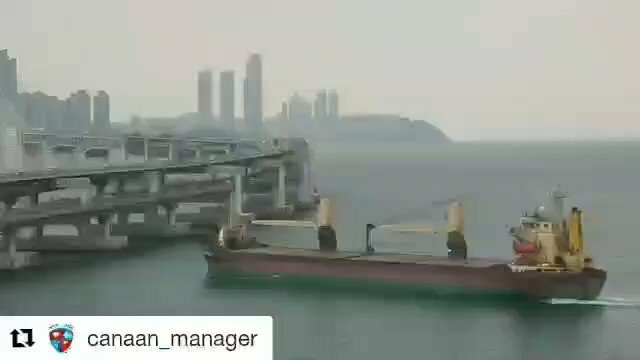 Trump's comments made it seem like North Koreans had asked for ALL sanctions to be canceled. 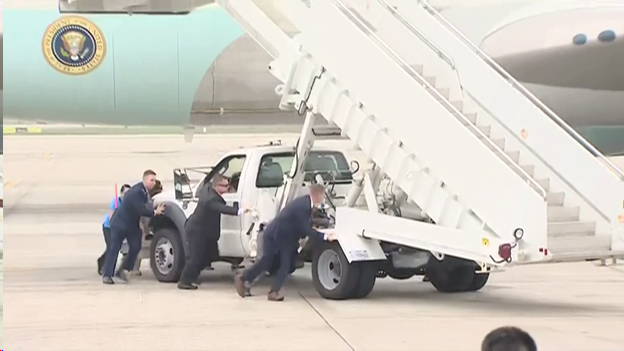 Kim-Trump summit: Looks like the staircase truck had an engine problem, and men in suits had to push it away from Air Force One. KCNA: "A delegation of the Foreign Ministry of the DPRK led by Vice-Minister Ri Kil Song left here Thursday to visit China." "I don't think the top leadership (in DPRK) knew about it," replies @POTUS. "No we haven't" replies @POTUS to question from @margarettalev on whether he's committed to a 3rd #TrumpKimSummit. "We did talk about China today a lot," says @POTUS taking a second question in a row from mainland Chinese media. 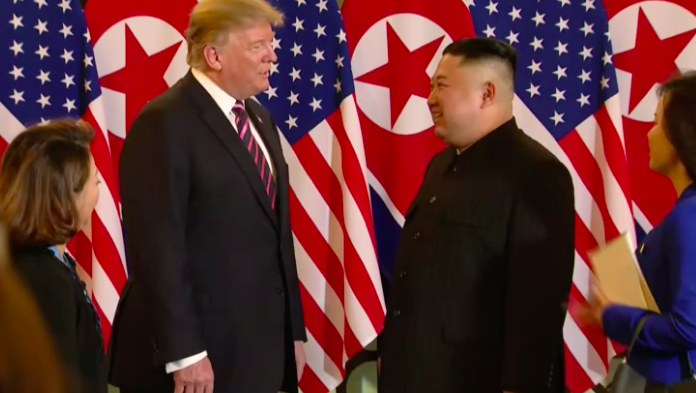 "He said he's not going to do testing of rockets and missiles or anything nuclear," says @POTUS of Kim. 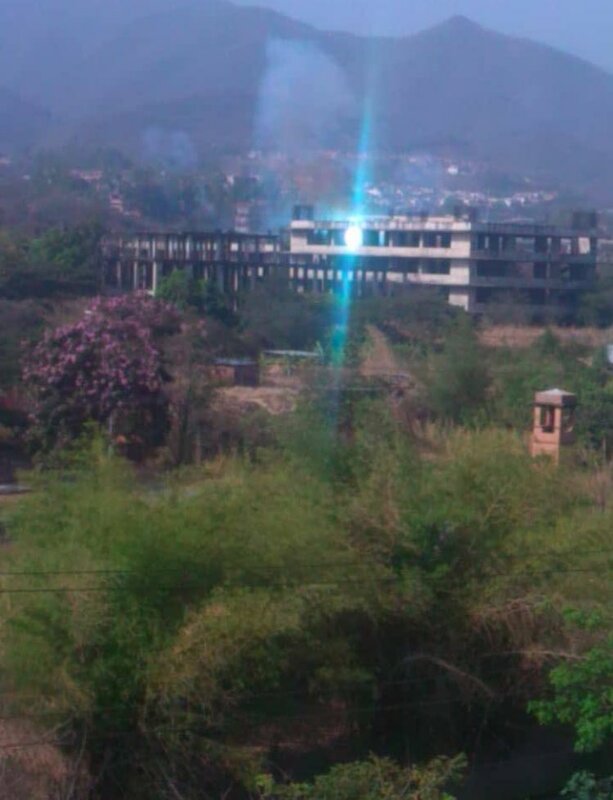 Dismantling Yongbyon complex was discussed in exchange for lifting of sanctions, says @POTUS. "We brought many points up that they were surprised that they knew." 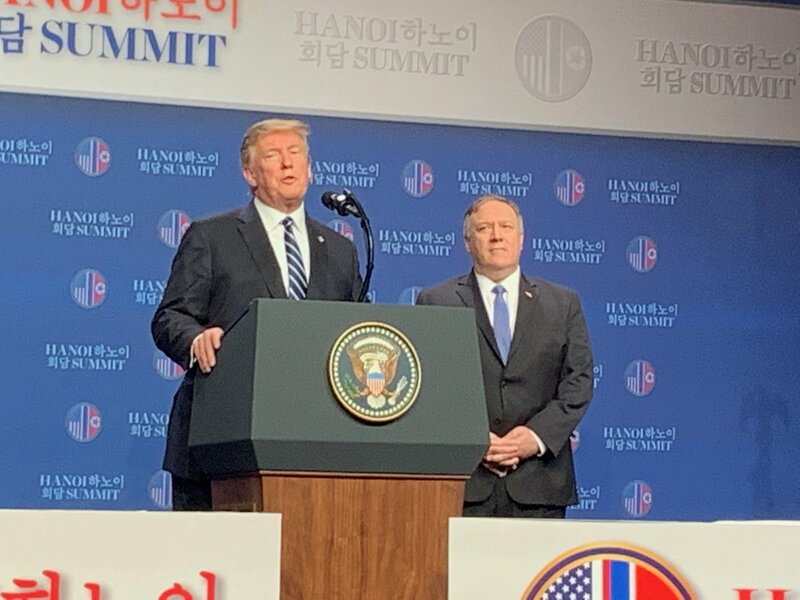 "We hoped we could do more," adds @SecPompeo. "Real progress was made." Kim promised @POTUS last night "he's not going to do testing" of "rockets and nuclear. "He has a certain vision and it's not exactly our vision" on denuclearization, says @POTUS. DPRK wanted sanctions totally lifted, says ⁦@POTUS⁩. Trump press conference begins the HanoiSummit press conference and thanks Vietnam. He says "reasonably attractive news" from India and Pakistan—says US has been involved. "Hopefully that'll be coming to an end." 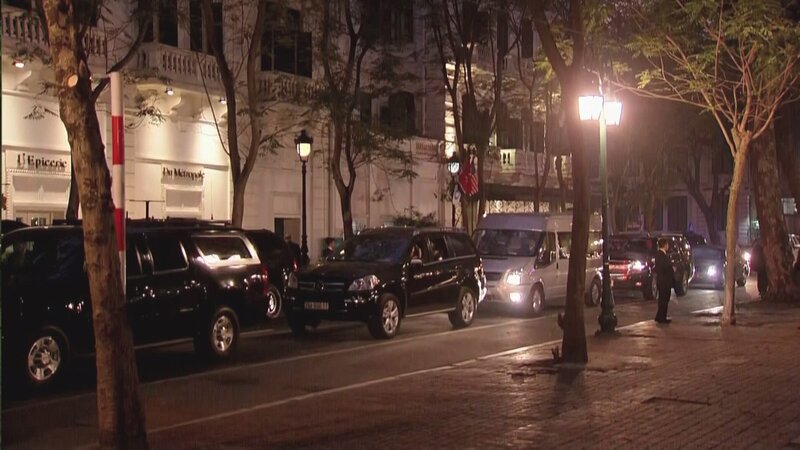 Kim Jong Un's Mercedes-Benz left the Metropole Hotel at 1325 local time. It seems that a joint singning cermeony has been canceled. The 2nd #TrumpKimSummit is over with the lunch cancelled and no apparent joint signing of a declaration as had been scheduled. Sanders suggested Trump will explain at his presser. WH press pool waited in Metropole dining room, where plates and menus were set up, but delegations never showed up. After 30 min delay we were ushered out. WH official said "there's been a program change." 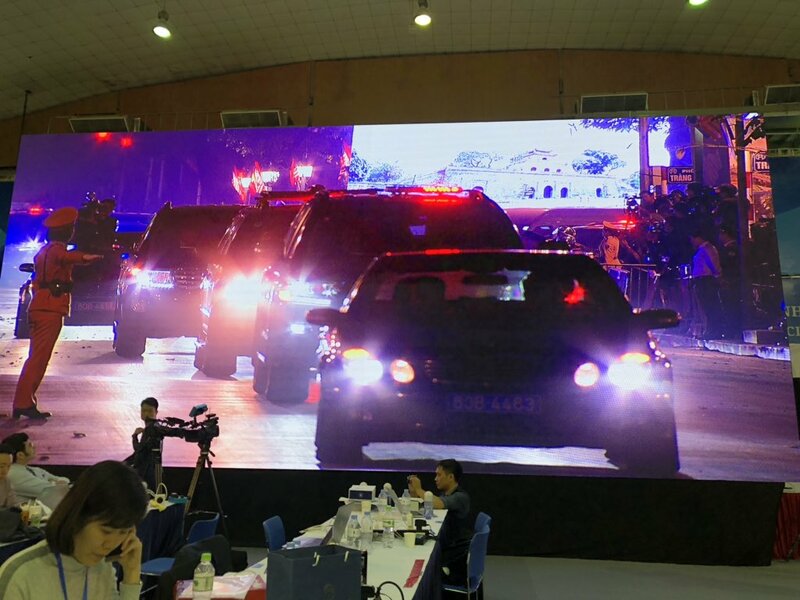 Major change of plans at #hanoisummit. Sarah Sanders said the talks will wrap up in next 30 to 45 min, then Trump will go back to Marriott. His presser moved up 2 hours to start at 2 p.m. Not clear but joint signing ceremony and bilateral lunch appear canceled. 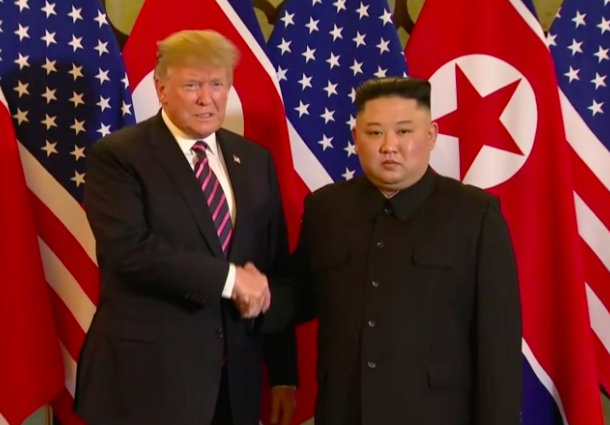 KCNA: "Kim Jong Un said goodbye to Trump after the dinner. 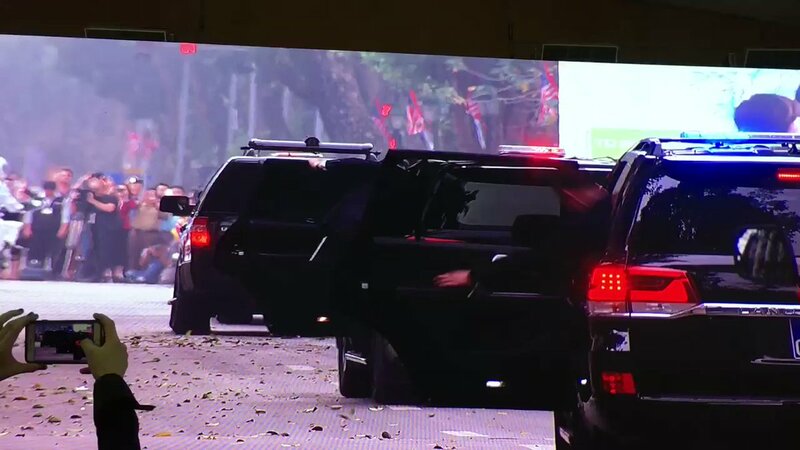 Kim Jong Un completed the first-day schedule of the historic second DPRK-U.S. summit talks and left for Melia Hotel. 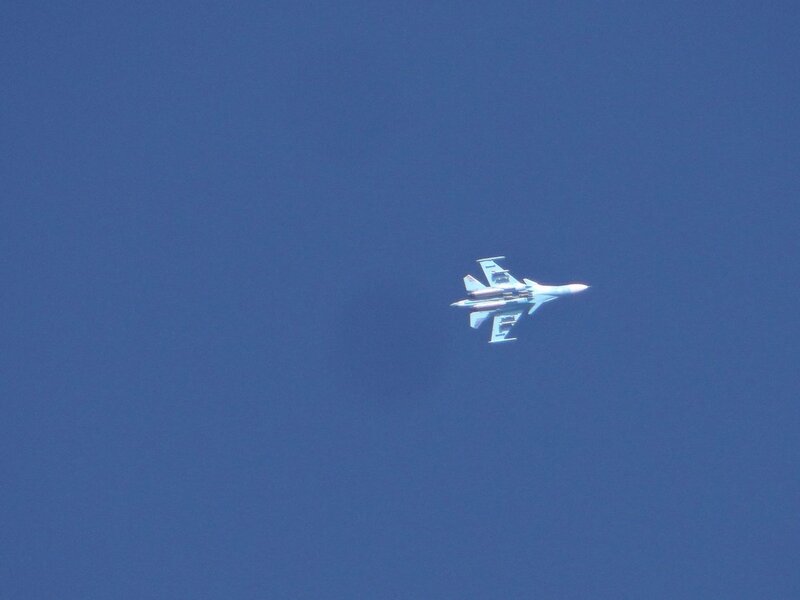 The top leaders of the two countries will continue their summit on Thursday." KCNA: "Sincere and deep opinions were exchanged with a view to making comprehensive and epoch-making results in the talks in order to meet the interest and expectation of the whole world for the successful Hanoi summit." KCNA: "The dinner was held in an amicable atmosphere with the top leaders of the DPRK and the U.S. and other figures of the two countries sat at a round table in a friendly way. At the dinner, considerable progress made in the bilateral relationswere highly appreciated." KCNA: "Then they had one-on-one pleasant chat to have a candid and honest dialogue. At the end of the one-on-one chat, they had a social dinner." 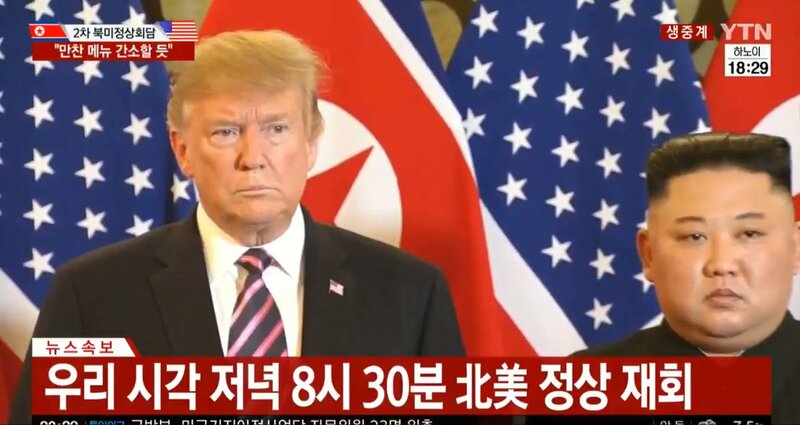 KCNA: "President Trump said that he was honored and happy to meet Chairman Kim Jong Un again and that he was sure that the talks would be very successful, noting they had very nice relations with each other." KCNA: "He added that this period required lots of deep thinking, efforts and patience than ever before and that excellent results wished by all will be made in the talks and he would do his best to this end." KCNA: "Kim Jong Un said that mistrust, misunderstanding, hostility and old practices tried to stop our ways but we broke and overcame all of them and again walked towards each other to finally reach Hanoi in 260 days." KCNA: "The top leaders of the two countries who deepened their friendly feelings through the Singapore summit last year and such occasions as subsequent exchanges of several personal letters exchanged warm greetings and made well-wishing remarks." KCNA: "National flags of the DPRK and the USA were displayed side by side in La Veranda conference room of Metropole HotelKim Jong Un met Donald J. Trump in 8 months and exchanged firm handshakes with him. They had a photo taken against the national flags of the two countries." KCNA: "The historic second meeting of the top leaders of the two countries began at 18:30, February 27, local time, followed by one-on-one chat and dinner. 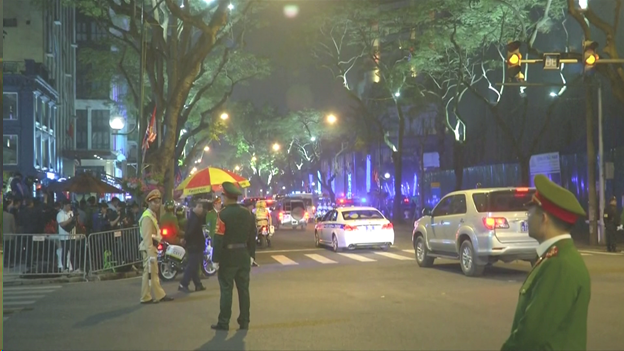 Kim Jong Un arrived at Metropole Hotel, the place of the meeting with the president of the USAescorted by guard vehicles." KCNA: "The historic second DPRK-U.S. summit and talks began in Hanoi, Vietnam thanks to the ardent wishes, active efforts and extraordinary determination of the top leaders of the DPRK and the USA to end the evil cycle of confrontation and antagonism." KCNA: "Supreme Leader of the Party, state and army Kim Jong Un, chairman of the Workers' Party of Korea and chairman of the State Affairs Commission of the Democratic People's Republic of Korea, had a meeting, one-on-one chat and dinner with Donald J. Trump."